The conference explored how practitioners and providers are using ICT to build the resilience of communities across Africa, Latin America and Asia. More than 400 NGO staff members, donors, educators, government representatives and technology providers attended the conference’s presentations. Exhibitors, speakers and CRS organizers made up 37% of the total attendance. 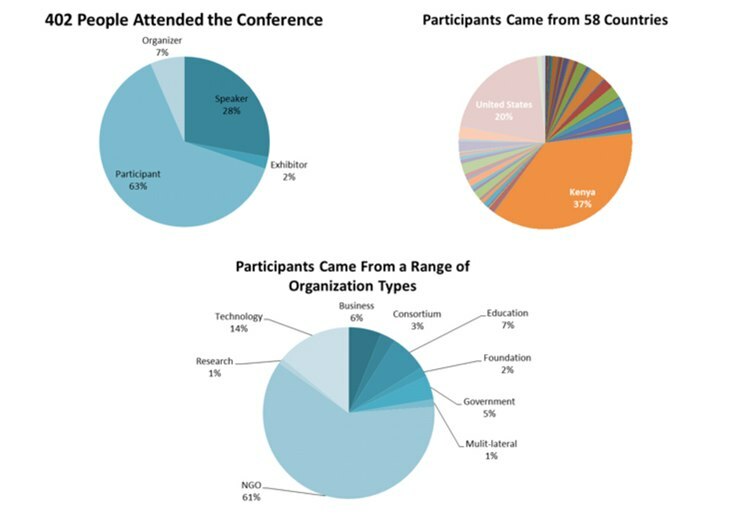 Participants came from 58 countries around the world, including from Kenya (37% of participants) and the United States (20%). Some 156 organizations were represented—or 129 if we group together the members of federations such as Oxfam and World Vision. International organizations and local NGOs made up the largest portion of the attendees (61%), followed by technology companies and businesses (20%), and research, educational, governmental, and multilateral organizations and foundations (19%). The postconference survey of participants indicated a high level of satisfaction with the conference. No one rated the conference below “Good,” and 91% rated the conference “Very Good” or “Excellent.” The survey also indicated that 99% of the participants felt they received good, very good or excellent value for the money they spent on the conference. This year, CRS issued two challenges in association with the conference. Telling compelling and meaningful stories is a critical part of the work of any international development organization. Stories engage donors, draw people to the field and reinvigorate those who work in relief and development. ESRI Story Maps represents a powerful new way to tell stories by combining online maps, intelligent web applications, text, multimedia, and interactive functions. We challenged participants to use ESRI Story Maps to create a map that illustrates resilience in East Africa. A panel of judges chose the winner based on three criteria: aesthetics, story and relevance. Mandi Ashford from Catholic Relief Services won the award for her story map illustrating resilience in the face of drought in Isiolo, Kenya. Suite of innovative software products designed to support CRS agricultural programming around the world. It enables farmers to improve their livelihoods by developing customized business plans that include details about their costs, revenues, sales and profits. We challenged participants to design a better interface for the Business Planner tool. The challenge appeared on Appirio’s Topcoder Network—a worldwide network of software developers. A panel of judges chose the winners based on four criteria: responsiveness, look and feel, ease of implementation, and creativity. Muhammad Arifin Siregar from Medan, Indonesia, won first place. Hikmah Aryadi from Surabaya, Indonesia, won second place. Appirio funded the awards for this challenge. We are grateful to our sponsors for their generous support in making this conference possible.